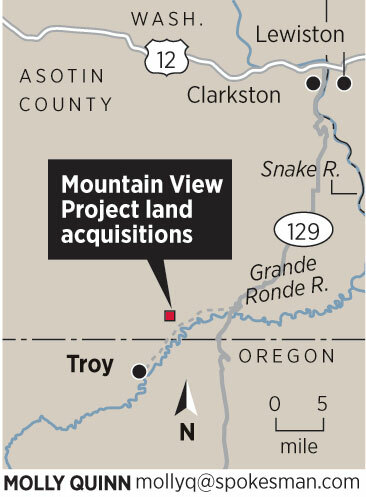 Map shows Area of 4-O Ranch added to Chief Joseph Wildlife Area near the Grande Ronde River. An Asotin County ranch purchased by the Washington Department of Fish and Wildlife last winter is open to public walk-in access this year with the exception of some big-game hunters. Deer and elk hunters are allowed on the newly-acquired addition to the Chief Joseph Wildlife Area only if they drew a “4-O Ranch” special hunting permit. “The restriction is an effort to provide high- quality hunting opportunities and was something the rancher wanted as a condition for sale of the property,” said Madonna Luers, agency spokeswoman. The 2,180-acre 4-O Ranch parcel was purchased in January. It brings the wildlife area total to 14,055 acres. The ranch is within Game Management Unit 172. But neither GMU 172 permit holders nor general-season deer and elk hunters are allowed to hunt the parcel this year. Small game, turkey, cougar and bear hunting, plus fishing and wildlife viewing, is allowed on a 4-O area, but hunting deer or elk without the 4-O permit is not allowed. The 4-O Ranch parcel of the Chief Joseph Wildlife Area lies along two miles of the Grande Ronde River and north along Cougar Creek. Many of the new property lines have been identified with “Wildlife Area” signs.